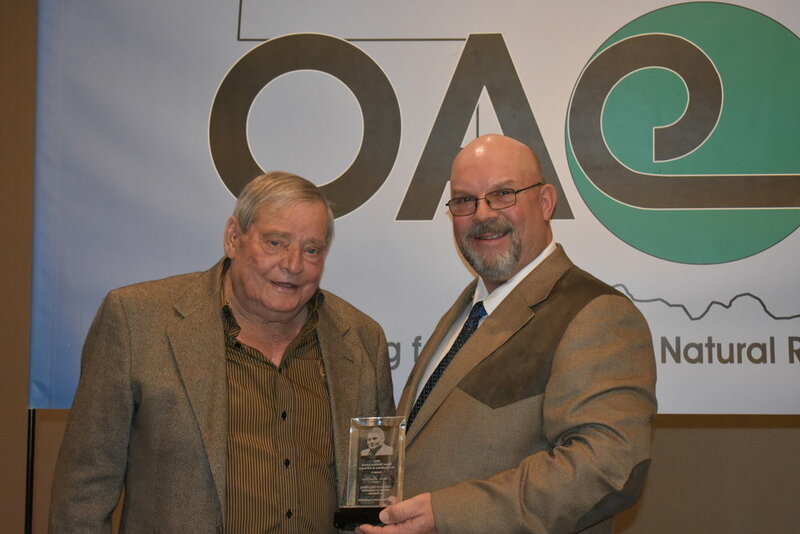 The Oklahoma Association of Conservation Districts (OACD) celebrated it's 80th anniversary Feb. 25- 27 in Oklahoma City. More than 350 conservation district directors, employees, and partners gathered to honor the progress of natural resources conservation from 1938 to 2018. On Feb. 25, the awards were presented to youth from across the state for their entries in speech, essay and poster contests. More than 7,000 students competed in the OACD/OACDE Youth Contests in 2017 and winners received a cash prize and plaque. That evening, Congressman Frank Lucas (OK-3) spoke to the crowd during the "Happy Birthday Conservation!" celebration. "As a farmer/rancher and as a member of Congress, one of the things I am most proud of is Oklahoma's continued success in conserving our state's natural resources for the next generation," Lucas said. Guests also enjoyed live music by Thomas, Oklahoma, native Jared Deck. The first general session opened Feb. 26 with remarks by OACD President and Leedey, Oklahoma farmer/rancher Jimmy Emmons. Session topics included conservation planning, local working groups, increasing diversity participation in state and federal programs and a conservation advocacy workshop. Inaugural "Elmer Maddux Award for Conservation Advocacy & Stewardship" - Elmer Maddux of Mooreland, Woodward County Conservation District. 2017 Conservation Legislator of the Year - Representative Mike Sanders of Kingfisher. Outstanding Employee of the Year - Cindy Bierig of Fairview, Major County Conservation District. 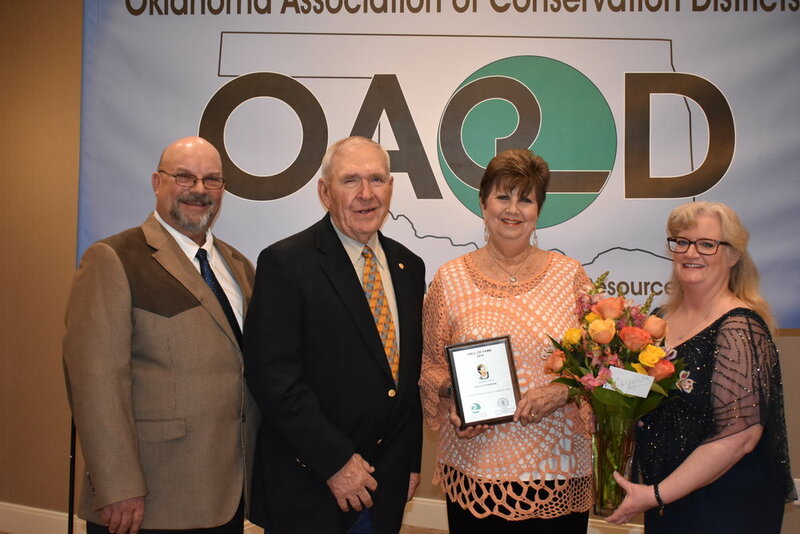 Conservation Hall of Fame - Phyllis Stunkard, Wagoner County Conservation District, for her role as the auxiliary treasurer for over 30 years. Conservation Hall of Fame - Dale Jenkins, Hughes County Conservation District. On Feb. 27, OACD hosted "Regenerative Agriculture: Staying the Course." This full-day event featured experts on holistic management topics including grazing, soil health, cover crops and pollinators/beneficial insects. The workshop gave attendees the opportunity to hear from local farmers/ranchers who shared their experience and lessons learned while implementing holistic management practices. Speakers included Dr. Richard Teague of Texas A&M, Dr. Jonathan Lundgren of Blue Dasher Farms, Didi Pershouse of the Soil Carbon Coalition, Keith Berns of Green Cover Seed, Jim Johnson of the Noble Research Institute, Kansas farmer Gale Fuller, and Oklahoma farmer/rancher, Russ Jackson. The 2018 OACD State Meeting was sponsored by the Natural Resources Conservation Service, the Oklahoma Conservation Commission, EcoDrum, Invenergy, Plains & Eastern Oklahoma, Enel Green Power and Farm Credit of Western Oklahoma. Click to see more photos from the 2018 OACD State Meeting.